The quote above is worth the entire journey of tears that this little children’s book takes you on, as you move from the self-centered heart of a china rabbit to one that has been broken open with love and hope. 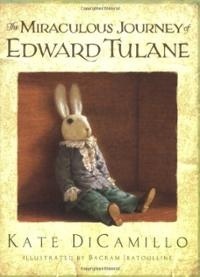 An amazing piece of contemporary children’s literature, DiCamillo’s book at first reminded me of the classic Velveteen Rabbit but the resemblance is soon left behind as we move through the story. Being of somewhat melancholy temperament myself, I must admit that the sadness was at times too much for me, and wondered how children would relate. However, I know that children read books at a very different level, and that they would take the message in their own way. I would be sure that you know your child first. There are a few heartless adults in the story, though the moments are short. On the other hand, this children’s book could be healing to the heart of any child who suffered loss or harm from others. I’m also grateful for the wonderful use of language in this children’s book, which is never condescending, and in fact will stretch the best readers. There are so few contemporary writers who make language an equal priority with plot, and DiCamillo does it beautifully in this book. Read it and weep; Read it and let your heart open. Then, share it with a child.